The once humble biobank has become a fundamental, global piece of research infrastructure. Looking to the future, biobanks will only become more important. Biobanks integrate clinical data and biological samples from both patients and healthy individuals. They have become repositories that will continuously affect patient care and outcomes. Therefore, investment of time and resources into developing workflow processes for these large global repositories is paramount. Malm et al.1 have developed a novel workflow system to better ensure sample integrity and decrease sample processing times. Earlier standards stored biomaterials in 5–10 mL sample tubes in 96-tube systems. However, sample stability is heavily reliant on storage: vials need to be tightly sealed, they need to be stored at the correct temperature, and freeze/thaw cycles can damage specimens. With current storage systems, each tube is regularly used on multiple occasions by multiple users, and subjected to multiple methods of sample handling and storage, across multiple laboratories. This is not ideal. Most mistakes occur before any experiments have taken place. As many as 60–70% of mistakes occur as pre-analytic errors. In order to improve sample quality and longevity, the investigators instead devised a system based on single use of samples. That is, once a sample is thawed for use, it is not returned to the biobank. The researchers replaced the current 96-tube system with a 384-tube system that uses sample sizes of 50–70 μL. To make the larger sample numbers feasible, they employed a novel workflow process using a high-speed sample array robot. The investigators applied their workflow to cancer and cardiovascular studies, using Thermo Scientific instrumentation, under three different conditions: room temperature, 5–8°C, and -20°C. They began by separating peptides using an EASY nanoLC 1000 UPLC system, which they then analyzed with a Q Exactive mass spectrometer in positive ion mode. 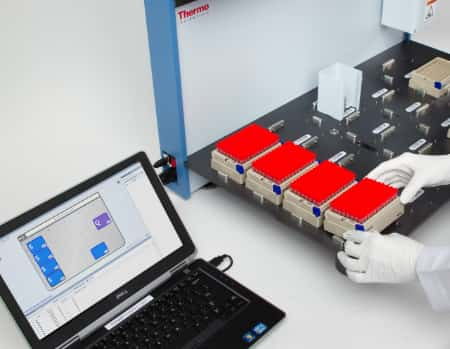 The Thermo Scientific SampleArray tube handler is specifically designed to handle 384-tube plates, can hold up to 20 plates and can operate at temperatures as low as -20°C. Each transfer step took 4.5 seconds, resulting in a total experimental time of 13 hours of nonstop processing to transfer 10,000 tubes. The investigators reported that in one month they had no failures and the workflow maintained sample quality, which they measured by liquid chromatography–mass spectrometry (LC-MS). The investigators measured the reliability of their methodology by performing repeated picking and sorting steps as well as checking sample quality using LC-MS analysis on stored samples. Further to this, Malm et al. tested the sample tube tightness and found no trace of leakage or deterioration from lids not being put on tightly enough by the handler.The workflow was also able to optimize storage capacity of the biobank. That is, as samples from a given rack wer used in research, the SampleArray efficiently replaced those samples with new samples and tracked them for subsequent retrieval. Using the SampleArray enabled the researchers to semi-automate and standardize the entire process. It minimized errors of sample handling and improved sample quality. Additionally, it provided users with more practically sized sample tubes, preventing further opportunities for biospecimen damage. Malm, J. (2015) “Semi‑automated biobank sample processing with a 384 high density sample tube robot used in cancer and cardiovascular studies,” Clinical and Translational Medicine, 4(1), doi: 10.1186/s40169-015-0067-0. Biobanking versus Biohoarding: How Do We Ensure Health Outcomes from Biobanks?